I hate ripping out seams. Especially after serging. I’m working on the #101 dress from the February 2009 Burda Magazine. I’ve had the lining cut out for at least three weeks but haven’t sewn in that time frame. Last night I *finally* had a couple hours to sew and ran to the sewing room to work on this. It’s taking so long to construct that I fear losing interest. Here’s where I got last night. No bad for two hours work, eh? Except. I forgot to interface the front facing. *tththhbbbpppptttt* I had a little phone consultation with Trena. She said I needed to take it out, recut the facing and interface it. I wanted to cry. Not because it’s an obscene amount of work. But, because I was tired and had fought with the sleeve insertion taking it out, reinserting and still fudging. I was just ready to move on. I realized I left off the interfacing because the facing seemed a bit off grain. But, in the light of morning, it’s not looking that bad to me. I think I’m going to cut interfacing, fuse into the seam line and call it a day. What do you think? Rip it? or just Retroactively fuse it? If you think that fusing after the fact will work, then I would try it. The other thing I would keep mind is that if I did not work,* then I would consider making (horrors!) a new lining. I wish you luck. I feel you on this, I only do ripping if it’s absolutely necessary. Retro fusing works just the same for me, I’ve had to do that on a jacket before. Just get it as close as possible to the stitching. Just fuse onto what’s done already – even if you go over the stitching a bit it won’t hurt. Just be very careful to lay the facing out so that you don’t crease anything underneath as you’re pressing. It’ll be fine. Can’t wait to see the finished dress! If it were me, I’d rip it out but then I’m a little OCD about these things. Serging is easy to rip out if you clip the needle threads every 10-12 inches and gently pull them out. Retroactively fuse!!!! Seriously, don’t waste extra time on it, especially since very little of the facing will be seen on the right side. The interfacing will never be seen, at least I hope not. The interfacing will get sewn in anyway, when attaching the fashion fabric and facing/linings together anyway if you leave the seam allowance on the front edge side. Rip it out. In the end you will be satisfied having ripped it out / done it properly. I have successfully fused after I sewn and serged the seams with little problems. I say fuse it carefully and you should be fine. You really only need the interfacing on that facing to maintain the shape of the edge where it joins the dress. I’m gathering from your post that you haven’t et joined the lining and the dress together yet, right? So just fuse the facing as much as you can. I’d try it retroactively too. You don’t need it in the sas and you do need it for the buttonholes. But I am confused as to what you serged. If it’s a hidden seam, ie front edge, it doesn’t need to be serged. I think I’d go with the retroactive approach as well. Just make sure the length of the facing is perfectly straight, smooth, etc. 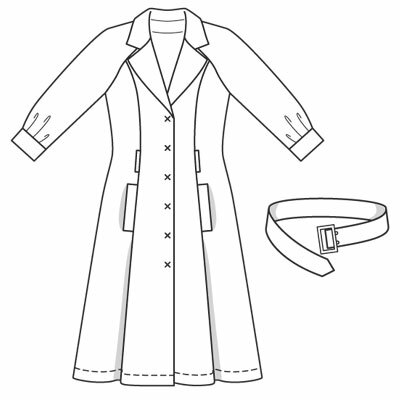 Draw a new grainline on it, pin a larger-than-required piece of interfacing to it with the grain as required, and baste-fuse in little dabs of the point of the iron first, then trim to size. Since the edge of the facing that’s attached to the lining will be invisible from the outside anyway, you can stitch the interfacing down right next to the working seam. It won’t show. I would just fuse it. But then again I am not a perfectionist. Retroactively fuse it – it looks like delicate fabric and that’s a lot of ripping to do. And especially because you might be losing interest! It’s better to finish it up and take a mini-shortcut than toss it in a drawer and never finish it 🙂 that’s my two cents, good luck! Retroactively fuse the thing. You’ve already cried over it, now fix it the most efficient way, and show it who’s boss. If you put it into time-out, you might not go back to it. And that would be a shame! retrofuse, definitely! unless you are a perfectionist..
Can’t wait to see it finished- I’ve loved this pattern for a long time. Long before I learned to sew properly I never interfaced anything. If your fabric is thick you may not need it. my suggestion for what it is worth is to fuse and handsew in a long strip behind where the buttons and the button holes will be positioned. I love this dress – have had it on the sewing list for so long but it takes an acre of fabric! O.k., I’ll old school. I’d rip it out and do it properly. Even though it’s a pain, when done the right way it always looks better. I know, last thing you wanted to hear, but I seem to learn something new when I gut it out. ok, so why do you have to interface it? I’ve done several items with no interfacing because i didn’t like the stiffness. If you need it for buttonholes, use tear away stabilizer on top and bottom (or a paper towel – Brawny works for more than spills) then tear it away afterwards. It works for me. Lots of RTW hardly uses any interfacing so first I would think about whether it was really needed at all. But if it was I would do the retroactive fusing thing. Not that this means it is necessarily the right thing to do, but I hate ripping out such large sections, I’d almost rather just start again! I vote with the fuse it crowd. 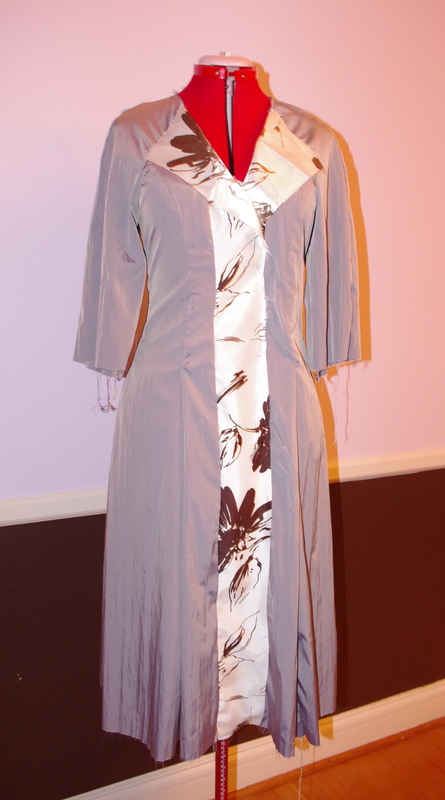 I have a jacket in which I used silk organza as interfacing and it’s too lightweight. I’m debating donating it or fusing a heavier layer. Too much hassle to rip so carefully just to get some stability. Retro-fuse the sucker. It’ll be fine (my new motto). But you do need interfacing in the facings of a button-up dress with lapels. You just do. I’m totally on the just fuse over it side. And then you can run a little more serging or regular stitching in the more likely spots, to hold it on. Really, it’s just a dress, if anyone else’s in it in a position to inspect your seams they’ll likely not have their mind on that.. However it occurs to me you may not have figured out the thing about running a seam ripper quickly through the lower looper loops, which allows you to just pull out all the threads almost as quickly as if you were undoing a regular seam? I’ve been a lot happier with my serger since I read that one :-). OK – here’s the deal…yeah, you could prob get away with just interfacing TO the seam instead of THRU the seam, and it would probably be OK (actually as far as looks and how it acts, it would be fine and wouldn’t notice a thing). But I’ve found it even harder to do this to the seam than take the whole thing out and do it to the edge of the fabric. You gotta match that thing all the way to the seam for the look to be right and sometimes it doesn’t quite get there. ‘Sides, I look at this as practice…and there should be one thread you pull out for your serger seam and the rest will fall out…I have a Bernette (Bernina serger) and I take out serged seams all the time this way. Hmhhh .. if you have enough fabric, maybe you can cut of the front facings and make new ones and add the 1-2cm you have cut off from the riginal facings? But to be honest, i would go the easy way interface the facings as they are …..